The XV-15 Tilt Rotor technology demonstrator was the culmination of efforts begun in the early 1950s to produce an aircraft that could takeoff, land, and hover like a helicopter, but with the speed of an airplane. The rotor pylons tilt from vertical to horizontal to eliminate the speed barriers imposed on conventional helicopters by retreating-blade stall and allowed the XV-15 to operate at speeds of 550 kph (345 mph TAS). This is the second of the two XV-15s built by Bell under a joint NASA/US Army program. It served from 1979 through 2003, demonstrating operations under a wide range of conditions and logged 700 hours in testing. Its success encouraged Bell and the US Marine Corps to develop a scaled-up Tilt Rotor, the MV-22, as a replacement for Marine transport helicopters. In association with Agusta Aerospace, Bell also developed the Model 609 civil Tilt Rotor with experience gained from the XV-15 program. In 1976 Air France and British Airways jointly inaugurated Concorde service to destinations around the globe. Carrying up to 100 passengers in great comfort, the Concorde catered to first class passengers for whom speed was critical. It could cross the Atlantic in fewer than four hours – half the time of a conventional jet airliner. However its high operating costs resulted in very high fares that limited the number of passengers who could afford to fly it. These problems and a shrinking market eventually forced the reduction of service until all Concordes were retired in 2003. In 1989, Air France signed a letter of agreement to donate a Concorde to the National Air and Space Museum upon the aircraft’s retirement. On June 12, 2003, Air France honored that agreement, donating Concorde F-BVFA to the Museum upon the completion of its last flight. This aircraft was the first Air France Concorde to open service to Rio de Janeiro, Washington, D.C., and New York and had flown 17,824 hours. 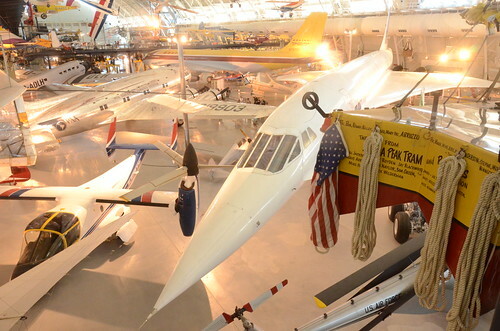 Also included, aircraft plaque: "AIR FRANCE Lorsque viendra le jour d’exposer Concorde dans un musee, la Smithsonian Institution a dores et deja choisi, pour le Musee de l’Air et de l’Espace de Washington, un appariel portant le couleurs d’Air France."